Ideal for: fresh juices, mousses, paste and fruit cocktails. Suitable for soft (blueberries, raspberries, strawberries) as well as hard fruit and vegetables (beetroot, turnip, ginger) and herbs, grass, sprouts (nettle, wheatgrass, dandelion). 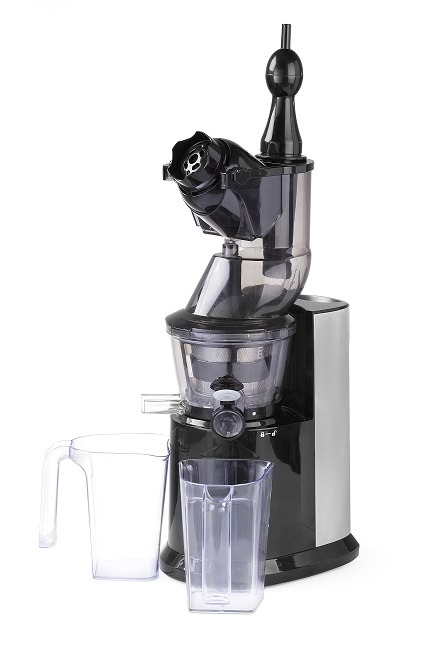 In comparison to traditional juicers, this device squeezes much more juice and the remaining fruit and vegetable pulp is almost completely dry which proves the exceptional performance of the device. The juice squeezing process is similar to mechanical cold-pressing. Number of rotations: 45 rpm. Reverse function to unblock the auger. Strong induction motor assuring high power and durability of the device. Very quiet at work: 65 dB. Magnetic protection prevents switching on if the head is incorrectly fitted. Maximum continuous work time: up to 20 min. Large feed chute with mechanism preventing the insertion of hands Ø83 mm (e.g. apples, pears, turnip). Small feed chute Ø42 mm with a pusher for long vegetables (e.g. carrots, parsnip, leek). Juice spout with a practical and tight cap. Inner strainer made of AISI 304 steel. Auger, strainer frame and strainer elements made of TRITAN – BPA free. Housing with a practical handle made of satin aluminium and ABS. Two polycarbonate containers for pulp and juice, 850 ml each. Cleaning brush with nylon bristles.